About 20 years ago my mother-in-law taught me how to do home canning and I have been doing it ever since! I love planting our garden, tending to it, harvesting the goodies and then preserving them for my family. We love zucchini and it grows really well for me. When I have an abundance of zucchini on hand, I like to make homemade Zucchini Pickles. Here is the recipe that I use. You will need 5 to 6 (6" long) zucchinis and 4 to 5 medium onions to make this recipe and the recipe will yield 6 to 7 pints of pickles. Combine together the first 6 ingredients listed in the recipe in a large stock pot. Bring mixture to a full boil. 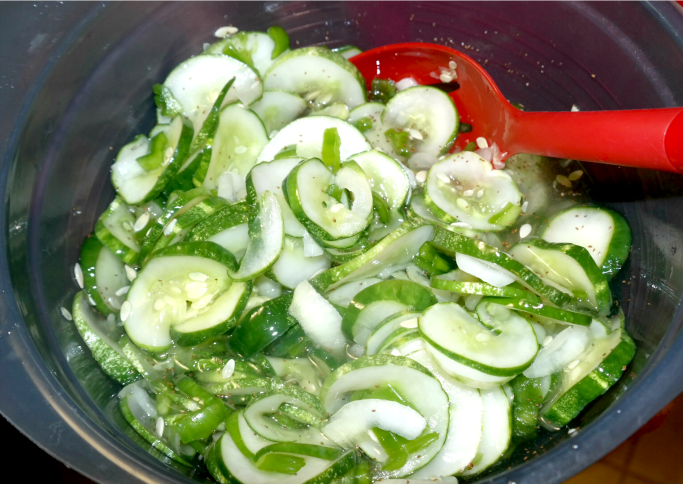 Place the sliced zucchini and sliced onions in a large bowl. Pour the hot mixture over the top and let it stand for 1 hour, stirring occasionally. In a large stock pot, bring mixture to a full boil, then simmer the mixture for 3 minutes over medium heat. Continue simmering the mixture over low heat while quickly packing 1 jar at a time with the pickles. Fill each jar to within 1/2" of the top, making sure that vinegar solution covers the vegetables. Place jars in a water bath canner and process according to your canners instructions for pickles. (about 6 minutes). Remove from water bath and let them cool.